Handmade on Delmarva - Eat. Drink. 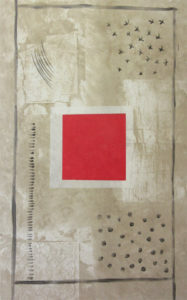 Buy Art on Delmarva. If holiday shopping can seem like a chore, why not make it an adventure? Take a road trip in the coming days and find some handmade treasures in our Maryland and Delaware small towns for unique gift giving. Best of all, our crowds are small, so you can enjoy a little peace in the shopping process. While you are shopping, check out our holiday weekend planner to schedule in some fun small town holiday events to enjoy on your visit. 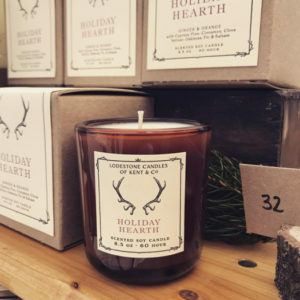 Artisan and graphic designer Greg Waddell’s handsome, high-quality soy candles, are perfectly packaged for gift giving, and come in a range of sophisticated scents that include Festal Forest, Holiday Hearth, Tobacco & Bayleaf, Snug, Whisky, and Turkish Fig. Sold locally at She-She in downtown Chestertown. Husband and wife, Dave and Patti Hegland collaborate on the design and construction of every piece of their art, which runs from intricately patterned bowls and plates to meticulous relief maps of beloved shorelines, including the Chesapeake Bay. Using strips of opalescent, transparent, and clear glass, the couple form patterns that are fired in a kiln and then extensively polished and shaped. The result has earned them a spot in 17 fine art galleries, including Chestertown’s Massoni Gallery and the Renwick Gallery in D.C. For sale at Create Gallery. Artist Faith Wilson’s floorcloths would be too pretty to step on were they not so durable and easy to maintain. The contemporary designs on canvas—often featuring birds, chairs, and circles—encourage contemplation of the complexities and wonders of this world. She thinks of her art as “a requiem to a moment that has just passed.” You can think of her floorcloths as a way to put vibrant art underfoot. Available at Create Gallery in Chestertown. Rob Glebe’s love of pattern, texture and nature shines through in his striking metal vessels. The bold pieces, often featuring leaves, pods and petals, explore metal finishes and patinas and are guaranteed to give any room an immediate focal point and conversation starter. Available at Create Gallery in Chestertown. Self-described “art worker” Marilee Schuman’s hand-shaped plates, bowls and cups become family favorites because she so beautifully merges form and function. The simply elegant pieces she coaxes from clay are highly functional and comfortable to use but also enhance the tabletops and counters they grace. Find them at Create Gallery in Chestertown. Keep heading east to Berlin and Snow Hill, along coastal Maryland, and you will find treasures made by local artisans from ornaments and home decor to soaps and beard balm. Like their handcrafted soaps, they to use natural materials in our products when possible. From Soap to beard balm, candles and skateboards. Making everything with the least impact to the environment and by hand. A fully operational glass blowing studio and gallery. Specializing in creating unique artwork for a variety of functions. This includes small gifts, hanging wall platters, centerpiece bowls, custom awards, pendent lights and chandeliers. A very talented group of artists that create a beautiful verity of handmade goods such as: paintings on unique material, holiday ornaments, home decor, candles, photography of local areas and much more. Hand painting and creating refurbished pieces of furniture using chalk paint and much more. Featuring many handmade items, created by local artists, that are suitable for gifts: paintings, hand painted scarves, pottery, glass sculptures, hand made jewelry, holiday cards and more. 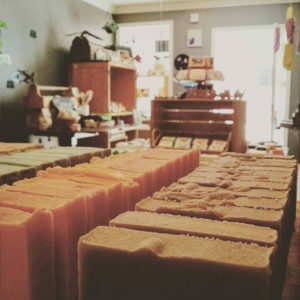 Shop owner Diane Armstrong handcrafts so many amazing items including, customer favorite, Whipped Body Butter in Calming Lavender or Sensitive Skin. Using only simple, quality ingredients, the whipped body butter nourishes dry, cracked skin. Customers have even reported it helps with eczema, along with reducing redness, swelling of body scrapes, and scarring. All that shopping works up an appetite so get yourself a treat! Here are some of our favorite treat stops. Unique homemade chocolates and baked goods. 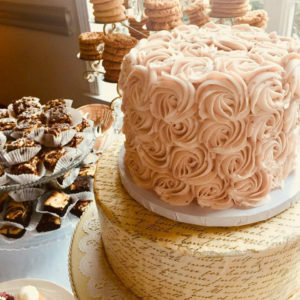 Unique homemade pastries, cakes for special occasions, pies, granola and so much more. Give yourself the gift of an ice cream break during all the shopping and pick up some handcrafted cheeses for your holiday entertaining. On your way back, swing by Salisbury’s Visitor Center and share the love for Salisbury with an SBY mug made by local artisan potter, Brent Zockoll! Southern Delaware is a great destination for shopping since the state famously does not charge sales tax. You can take a break from the outlet crowds and find great handmade gifts, while enjoying the slower pace. 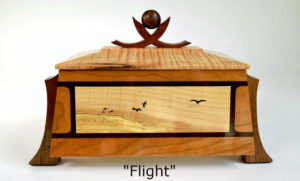 Imaginative fine woodworking by an award-winning wood craft artisan, Michael’s work is in the permanent collection of the Biggs Museum of American Art Selected to design and build the 2014 “Governor’s Award for the Arts” by the Delaware Division of the Arts. Find his work at Gallery 37 8 S. Walnut Street, Milford, DE. Lavender Fields at Warrington Manor is Delaware’s premier lavender farm, carrying a large inventory of lavender plants, bath, body & culinary products, and handcrafted items, as well as hosting a variety of events such as tours, weddings and classes. Also, the home of The Soap Fairy®, offering natural handcrafted soaps, bath salts, and lotions. Handmade ornaments, dog collars, reading pillows, scarves, bowl cozies and wreaths are some of the locally-made items you can find at this 120-booth marketplace featuring multiple vendors. All of our towns offer main streets brimming with creativity and local flare. Venture out to our shops over the holidays and wow your gift recipients while keeping your zen!